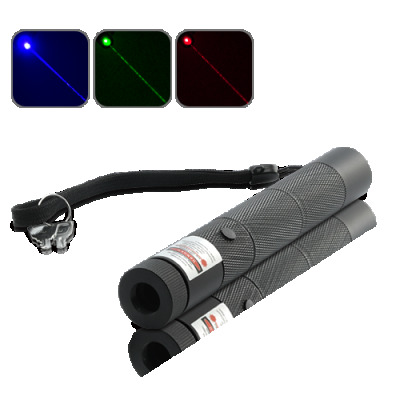 Successfully Added Extreme Power 3-in-1 Laser Torch (300mW Blue, 100mW Red, 30mW Green) to your Shopping Cart. All hail the Extreme Power 3-in-1 Laser Torch (300mW Blue, 100mW Red, 30mW Green)! With many different colors, this laser is immediately perceived as ahead of the pack in both style and technology. Housed in a solid metal case, this Laser Torch is a great choice for those who want the very best and latest in laser pointer technology. Featuring 3 different interchangeable caps to change the laser’s color and power, this laser torch conforms to any occasion. It’s great for presentations, lectures, museums, seminars, projection screens, charts, slides, tour guides and facility inspections. With a simple cap change, you can switch between different colors of laser including green, blue and red – whichever one you like! For more fun with your laser pointer, we have included 5 screw-on head attachments that will display five different types of elegant, gorgeous, splendid patterned laser projections! Even better, you can change every style of patterns by adjusting the head around, making it a super-cool romance environment creator for parties, bars, discos, etc. Worried about accidentally pressing the laser button or your children getting hold of this device? Well worry no longer - just lock the laser pointer with the lock switch! Finally, you can safely keep this laser pointer in your pocket, bag, and even out in the open without fear of your kids touching it!